Rochester Institute of Technology students have won a variety of international scholarships and fellowships for the summer term and upcoming academic year. Award recipients will be recognized at the Global Learning Symposium, from 3 to 5 p.m. on April 28 in the Golisano Hall atrium. 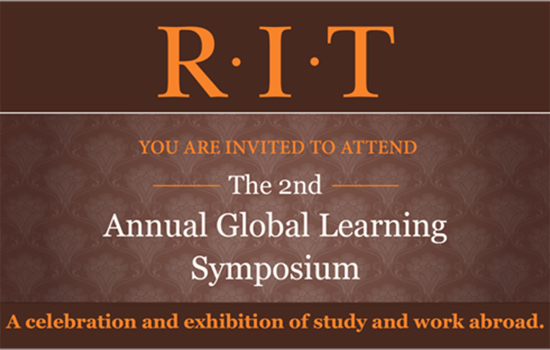 The second annual event celebrates study and work abroad, and the fostering of cultural knowledge and competencies in RIT graduates. “RIT students are global leaders in their disciplines,” said James Myers, associate provost for International Education and Global Programs. “They want to be part of the conversation, part of solutions to challenges we face as a world community, and they possess a powerful set of globally relevant skills and knowledge." Two RIT students have won Fulbright Fellowships. They are Yasmeen Smalley-Norman, a 2013 graduate (BFA, photojournalism, BS, biomedical photographic communications) from the College of Imaging Arts and Sciences, and Victoria Scholl, a fourth-year student majoring in motion picture science and imaging science in CIAS and in the College of Science’s Chester F. Carlson Center for Imaging Science. Mendy Yu, a mechanical engineering major in the Kate Gleason College of Engineering, who will study in Japan. Bernard Rodgers, a communications major in the College of Liberal Arts, who will study in Rome, Berlin and London. Hector Pineiro, a game design and development major in the B. Thomas Golisano College of Computing and Information Sciences. For information about study-abroad programs and international fellowships, go to RIT Global.